We will have tons of opportunities as a church to share the gospel and promote our Easter Sunday Service. Check the schedule below for dates and times that you can be a part of the effort to fill the Cal State Fullerton stadium as we hope to make sure the gospel is given to as many as possible. It is the desire of the church to invite all those in the surrounding area, and to do that, the whole body will need to get involved! We will have a huge map located near the main entrance to the sanctuary that has a 4-mile radius from the church. Our goal is to have an Easter invitation flyer laid at every door of every residential street on that map. Once a street is completed, we will have a designated person near the map to highlight the completed street until all the streets are highlighted. Your job is to grab a stack of flyers and begin handing them out in your neighborhood. For every street you complete, notify the person near the map to highlight each of those streets. We also want to encourage you to grab some Easter posters and see about getting them into local businesses. The posters are available at each of the entrances into the sanctuary. Please be sure to ask the permission of the business owner before you put up any posters as we want to be a good witness respecting their place of business. Meet at Morningstar Christian Chapel in room 4 from 1:00PM to 2:30PM for some special training on how to be equipped to share the gospel with others. This meeting is not mandatory in order to attend any of the events below but rather a resource to better aid you in evangelizing to friends, neighbors, and people you may not know. Meet at The Chapel Store parking lot at 9:00AM and we will carpool over to Hillview Middle School in Whittier. This is an outreach event where we will provide free snow cones to engage with those at the Whittier Area Youth Soccer fields and look for opportunities to invite them to our Easter service. Meet in Downtown Fullerton at the Amtrak Parking Lot to look for opportunities to evangelize, handout invites and ask local businesses if we can hang posters and leave flyers. 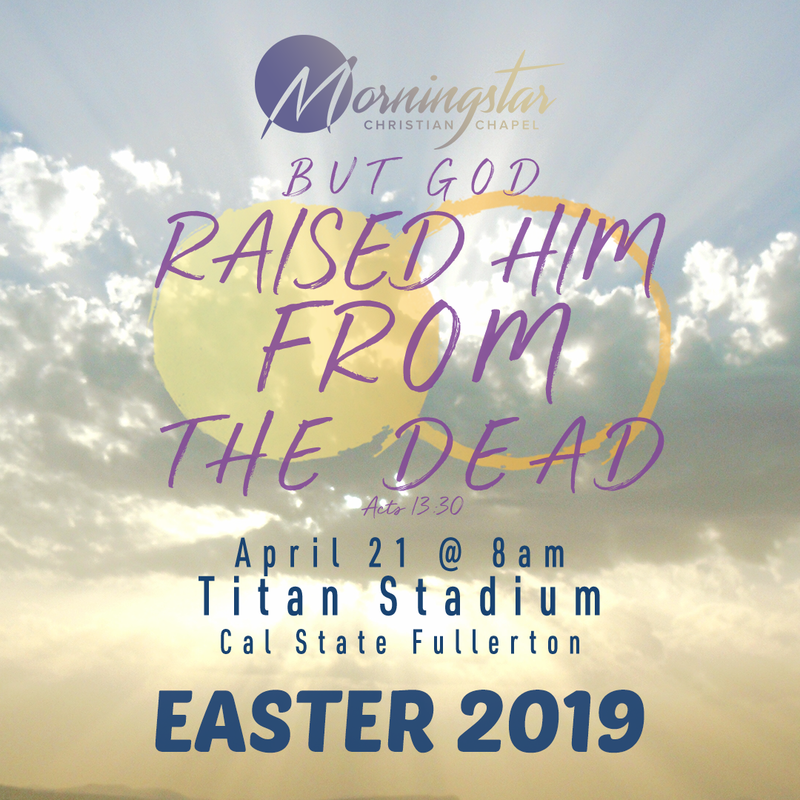 Meet at Morningstar Christian Chapel in The Chapel Store parking lot as groups will carpool to the neighborhoods surrounding Cal State Fullerton to distribute flyers door-to-door and hang up posters at local businesses. 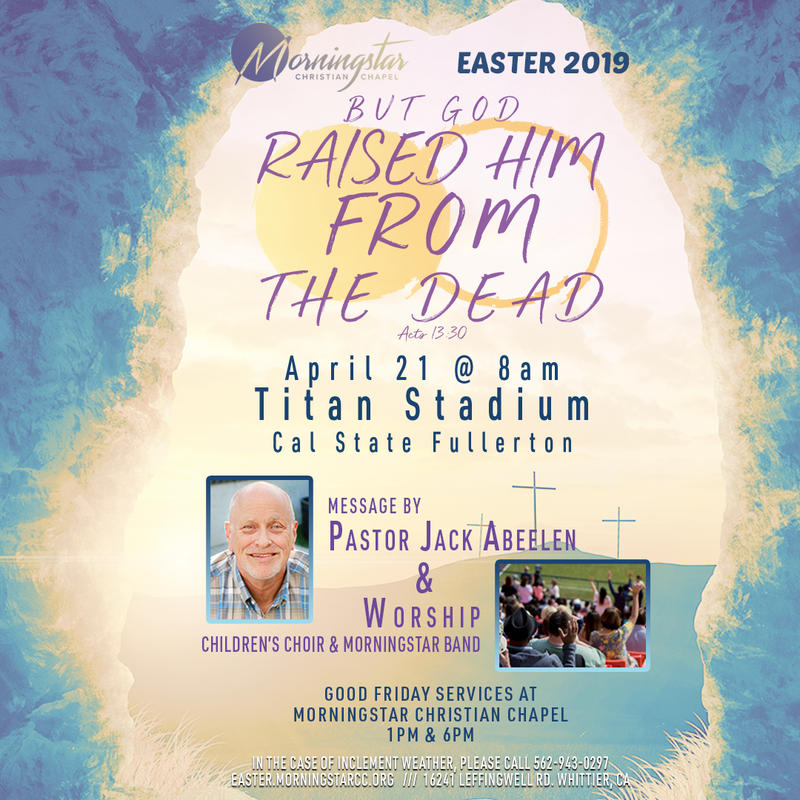 Meet at Morningstar Christian Chapel in The Chapel Store parking lot and go out in groups into the local areas around the church to distribute Easter invites. 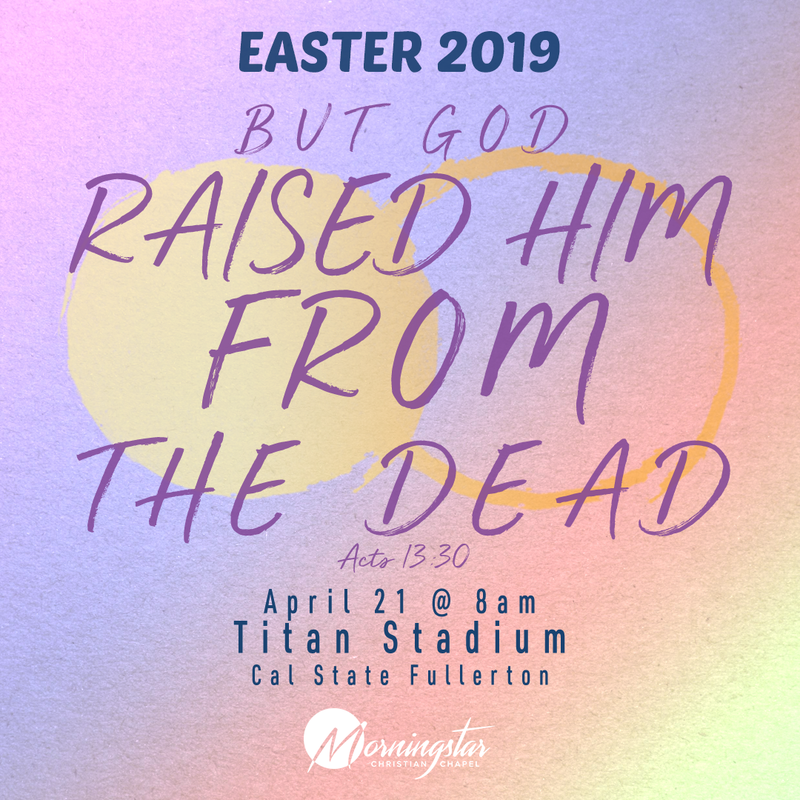 Meet at Morningstar Christian Chapel in Room 4 as teams will carpool to the Cal State Fullerton University campus and distribute flyers out to the students. Meet at Titan Stadium to clean the seats for the Easter service the next morning. Bring your own bucket and towels to wipe down the seats and some drinking water for yourself in case of warm weather. Volunteer to serve as a greeter Easter morning. Sign up at the Easter resource table located at the main entrance into the Main Sanctuary. *Youth under 18 that will not be accompanied by a parent will need to have a liability release form on file. Liability forms can be downloaded by clicking here. Please turn in completed forms to the Sunday School Office (Room 3) or the Church Office. *Interpreted event for the deaf. Download and share these graphics with people in your friends lists. Right click, or tap and hold the image then save it to your device. Be sure to write a detailed post inviting your friends and family to the Easter Service. And don't forget to use the hashtag: #MCCHeIsAlive or #BEWISEPROV1130.